Unfortunately, the majority of the population needs their wisdom teeth removed. 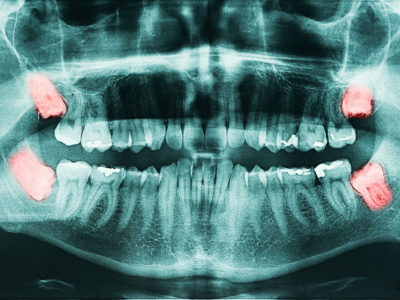 Wisdom teeth generally need to be removed because there isn’t enough space in the jaw for them. This causes them to come in crooked or not to emerge at all, which can cause lots of problems for the rest of the jaw. Because of all the potential issues they can cause, dentists recommend removing them before they cause a problem. What Happens If I Don’t Get My Wisdom Teeth Removed? Wisdom teeth are removed to prevent them from damaging your normal, healthy molars. A wisdom tooth that comes in sideways can misalign your bite, cause decay in itself and the neighboring tooth, can create an area where food gets caught, and can even lead to infection. If a wisdom tooth remains impacted and never erupts from the gum, there are still a lot of potential problems that could happen. The most serious of these is a relatively high risk of cancer in the epithelial lining around the wisdom tooth – yet another reason to get them removed sooner rather than later! However, a small percentage of the population is born without wisdom teeth, in which case, would never have to undergo surgery to get them removed. Will I Need To Get Mine Removed? The long answer: find a mirror and take a look at your bottom teeth. By the age of 12, you should see 2 molars at the back of your mouth. Your wisdom teeth would be your third molar. To see if you have room for wisdom teeth, take your finger and feel the space behind your second molar. If you feel a flat pad of tissue, you might have enough room. If you feel the tissue start to curve upward, you will likely have to get your wisdom teeth removed. Of course, this is just a rough estimation. You will need your oral surgeon to measure the space and give you an accurate answer. When’s The Best Time To Get Wisdom Teeth Removed? Once the roots fully develop, the surgery becomes far more difficult and the recovery time increases. This is because the roots anchor the tooth deep into the gums, so the oral surgeon has to dive deep and remove the root from the bone of the jaw. Teeth grow from the crown down, so if caught early enough, it’s best to get wisdom teeth removed before the root comes in. It’s important to allow a little time off to allow your jaw to heal after getting your wisdom teeth removed. A Friday removal is ideal because it gives the patient plenty of recovery time without having to take time off of school or work. The age from patient to patient varies, but it’s most common for 15-18 year olds to get their wisdom teeth removed. Dansville Dental offers free evaluations and consultations for wisdom teeth removal, so contact our office if you think you may need yours removed. Dr. Hale has over 30 years of wisdom teeth removal and the vast majority of our patients experience little to no bruising or swelling. We also offer a full range of sedation options for wisdom teeth removal.